It seems fitting to talk about exciting ongoings in The Meat Department the day I bring a leftover burger in for lunch. Okay, perhaps I should mention it’s a veggie burger. Now, I realize some people think becoming a vegetarian is a big mistake missed steak, but I don’t carrot all. Manna Food Center’s Nutrition Education department values providing Montgomery County residents access to a varied and balanced diet. 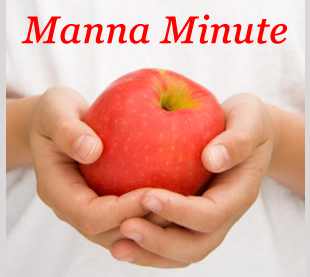 In the past, Manna has received meat for clients through The Emergency Food Assistance program or TEFAP, a program of the United Stated Department of Agriculture (USDA). The TEFAP menu can change often, however, and meat is not always available. 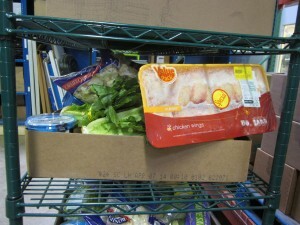 When TEFAP did not come through, Manna had to purchase meat to distribute for our Food for Families program. Despite being able to order meat from our partner food banks, it was always difficult to obtain enough on a budget of under $2.00/lb. Yes, beans, peanut-butter, and canned tuna are often the most cost-efficient ways to provide protein foods to our clients, but fresh and frozen meat offers further nutrient variety, and holds a special place in the food traditions and preferences of our families. This year, Manna is saving thousands of dollars thanks to additional rescued meat from Giant Food Stores. Rather than discard meat approaching its expiration date, Giant now freezes meat and poultry before it reaches this date and donates the product to Manna Food Center. While we had an existing food-rescue effort at local Giant stores, our friends at Capital Area Food Bank pointed us to additional stores that are now providing frozen meat on a regular basis. Every week, our hard-working drivers pick up hundreds (and sometimes thousands) of pounds of meat from 27 Giant stores in Montgomery County. Thanks to the success of this program, we can provide more meat to households than ever before, and the funds Manna saves can be used to buy more local vegetables to accompany this meat on clients’ dinner tables. Pat chicken dry. Pour oil or butter into a 9- by 13-inch baking dish. In a wide, shallow bowl, combine coconut and curry powder. 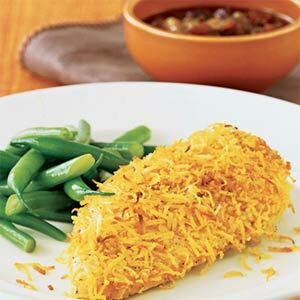 Dip chicken in oil or butter to coat, then roll in coconut. Place chicken pieces slightly apart in the baking dish. Pat any remaining coconut mixture on top. Bake chicken in a 350° oven until no longer pink in center of thickest part (cut to test), 20 to 25 minutes. Lindsey Seegers is the Program Manager of Nutrition Education at Manna Food Center. Her background is in Social Work and Nutrition; her passion is cooking food always delicious and nutritious. She teaches cooking and nutrition classes, and leads grocery store tours around Montgomery County about affordable and do-able healthy cooking. Since 1983, Manna has been feeding Montgomery County’s food insecure residents. In our 30 years of service Manna has served nearly 3 million people, 668,527 households, and distributed 45 million pounds of food. As the designated food bank for Montgomery County we are the main resource people turn to when they find themselves in need of food assistance. Manna delivers emergency food assistance through its three main programs: Food for Families, Smart Sacks, and Agency Food Distribution.